Images have emerged of what's claimed to be an upcoming Motorola handset which features a five-megapixel camera from photography heavyweight Kodak. The phone’s rumoured to be called the Motozine ZN5, Chinese-language site Keysj claims, and it’ll no doubt be punted as the ideal handset for photography enthusiasts, despite there being several five-megapixel phones on the market already, such as LG’s Viewty and Samsung’s SGH-G800 – reviewed here. 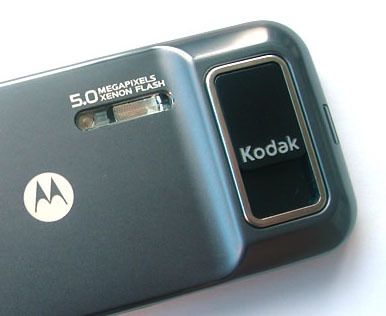 However, with the Kodak brand attached to the handset, it's clear the ZN5 will be pitched by Motorola against Sony Ericsson's Cyber-shot phones, which are also named after a popular photography brand. Kodak’s auto-focus snapper features a super bright xenon flash and pictures reportedly taken on the handset look clear and crisp. The two manufacturers have also built a sliding cover onto the ZN5’s camera section, protecting the lens from dust, grime and scratches. Little else is known about the phone, aside from the fact that it’s reasonably thin, has a 3.5mm headphone jack for audio and a USB port. A purple button on one side of the phone also looks like a shortcut key for image snapping. A European release date for the phone hasn’t been confirmed yet.